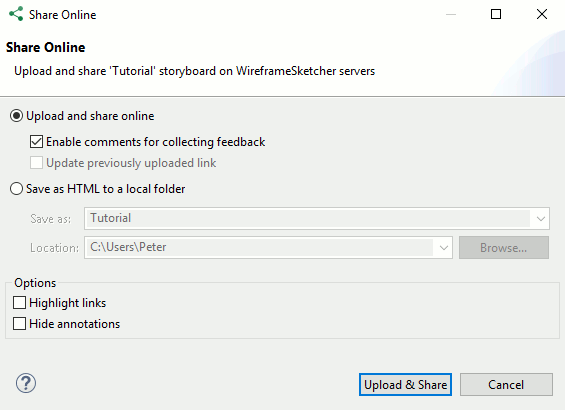 WireSketch.com is a free sharing and collaboration service offered to users of WireframeSketcher wireframing tool. Use WireframeSketcher to quickly create wireframes, mockups, prototypes offline and then easily share them online. Mockup your website, desktop and mobile applications offline and then upload and share them online directly from the app. No account creation is required. Uploads are fast, and the access to what you share is fast too. Share your wireframes using a unique, unguessable link. The link can only be accessed via secure socket layer technology (SSL). Uploads to our servers are encrypted using SSL too. Your data is stored securely in Amazon’s cloud. Let your clients and team members easily view your wireframes, click-through your prototypes, and then give you their feedback. Let them explore how your prototypes work on a tablet or phone. Note that we cannot guarantee absolute security as no method of electronic transmission or storage is absolutely secure. So if the security for you is paramount then please use your own servers for sharing.